Tanti auguri a me, tanti auguri a me!! 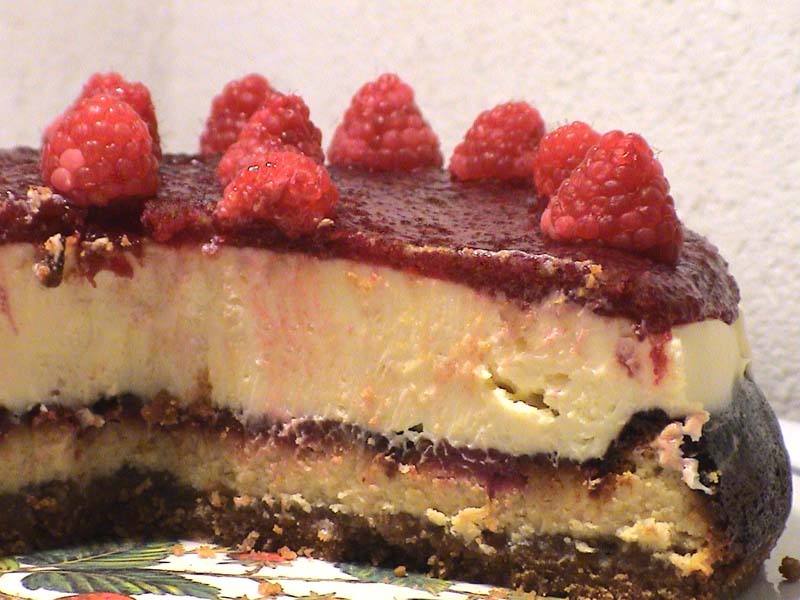 Per il mio compleanno (il 16 di settembre), ormai passato, mi sono regalata questa splendida cheesecake, in assoluto una delle mie torte preferite. Non è certo veloce da preparare, e non la consiglierei nemmeno a chi è a dieta o è attento ai cibi grassi ed ipercalorici; direi però che una volta ogni tanto qualche strappo alle regole bisogna pur farlo, e allora, perché non farlo alla grande?! Preriscaldate il forno a 180°. Ridurre in polvere i biscotti e mescolarli bene con il burro. Imburrate e foderate il fondo di una tortiera a cerchio di 26 cm con la carta forno e disponete il composto sul fondo schiacciandolo bene con un cucchiaio. Mettete in frigorifero per mezz'ora. Per la farcitura, fate sciogliere a bagnomaria il cioccolato. Fate raffreddare. Sbattete il formaggio, lo zucchero e il cioccolato, poi unite le uova una per volta. Lasciate 4 cucchiai di farcitura e mettete il resto nella tortiera. Ammorbidite i fogli di colla di pesce in acqua fredda per qualche minuto, scioglietela in un pentolino e aggiungetela alla marmellata scaldata, quindi versatevi il rhum, il colorante e la farcitura rimasta. Spalmate il composto sul dolce. 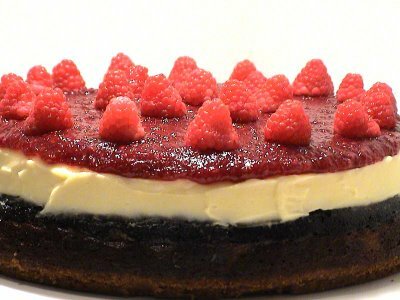 Fate cuocere per 50-60 minuti, quindi far raffreddare e lasciare la torta in frigorifero per una notte. Il giorno dopo, preparate la guarnizione: fate sciogliere il cioccolato a bagnomaria e Lasciatelo raffreddare. Mescolate il cioccolato, il formaggio e il succo di limone, quindi spalmate la guarnizione sulla superficie dela torta che avrete sistemato su un piatto. Tenete in frigorifero per 1 ora, o fino a quando la decorazione si sarà consolidata. Per la glassa, fate sciogliere la colla di pesce in un pentolino, dovo averla ammollata in acqua fredda, mescolatela alla marmellata e aggiungete il rhum. Fate raffreddare un poco, poi spalmatela sulla torta. Decorate a piacere con i lamponi.Tenete in frigorifero per almeno 1h. Prima di servirla, lasciare la torta a temperatura ambiente per 10-15 minuti. Happy Birthday to me, happy Birthday to me!! For my birthday (16th of september), now gone, I made for myself this wonderful cheesacake, one of my favourite cakes ever.It's not a quick one to make, and I would not recommend it to people on a diet or careful to fat and high calories food; however, I'd say that sometimes rules should be bended, and when you do it, you have to do it well! Heat oven at 180°C (350°F - gas mark 4). Crush the biscuits in a food processor, then mix them with the melted butter. Now press the mixture into the base of a loose-based tin of 26cm (10.2inch), buttered and covered with wax paper, and pop it into the fridge to firm up for half an hour. Meanwhile, melt white chocolate in a heatproof bowl over a pan of barely simmering water, then remove it from the heat and let it cool. Next, in a large mixing bowl, whisk together cheese, sugar and chocolate, add eggs one at a time until smooth. Leave aside 4tbs of this mixture and pour the rest into the tin. 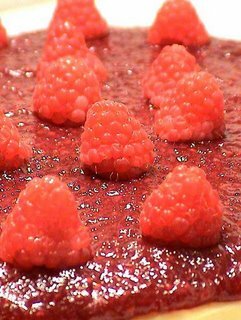 Put the gelatine sheets into cold water for few minutes, then melt into a saucepan and pour it over the raspberry jam, then add rhum, 4tbs of the mixture left aside and food colouring. Mix well and spred on the cake's surface. Cook for 50-60 minutes, then cool down and leave in the fridge overnight.The day after, prepare the topping: melt white chocolate in a heatproof bowl over a pan of simmering water, then let it cool. Mix together cheese, white chocolate and lemon juice. To unmould the cheesecake, first run a palette knife around the edge of the tin, then release the spring clip and remove it. After that, carefully lift off the base and transfer to a serving plate. Spread the topping over surface, then leave in the fridge for at least 30-40 minutes.For the icing: put the gelatine sheets into cold water for few minutes, then melt into a saucepan and pour it over the raspberry jam, then add rhum. Cool down a bit, then spred it on the cake. 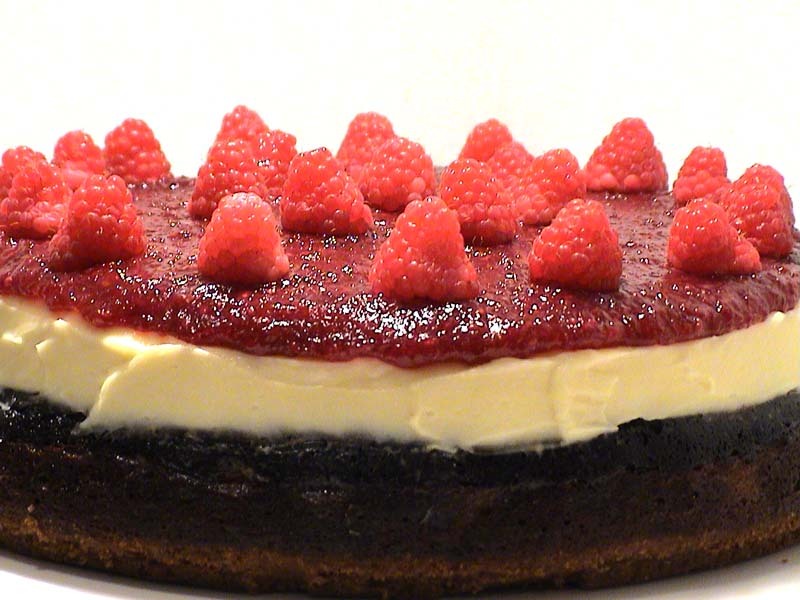 Decorate with fresh raspberries. Refrigerate for at least 1 hour. Before serving, leave it at room temperature for 10-15 minutes.